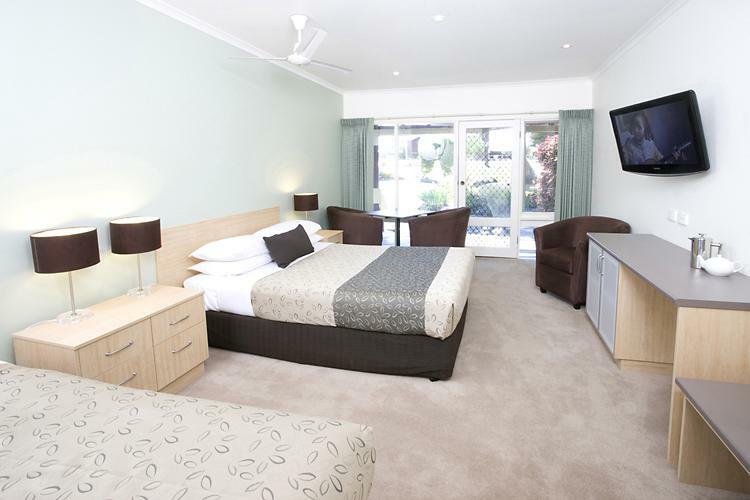 Refurbished 4 Star Room with 1 X King bed with ensuite bathroom. Room has an outdoor balcony with your own table and chairs overlooking surrounding bush. 106cm Plasma televisions with free 10 channel Austar TV. Wireless Broadband Internet Access. Catch the courtesy vehicle to town or your favourite restaurant. 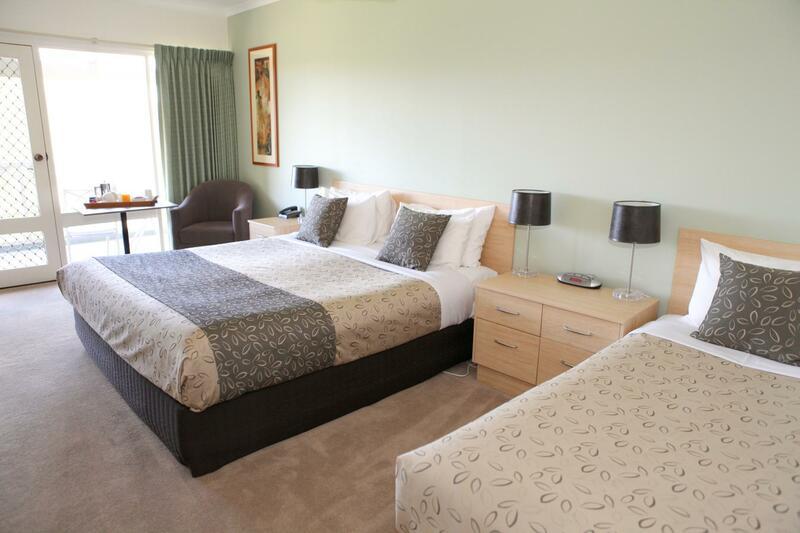 Refurbished 4 Star Room with 1 X King bed with ensuite bathroom. Room has an outdoor balcony with outdoor setting overlooking surrounding bushland. 106cm Plasma televisions with free 10 channel Foxtel TV. Wireless Internet Access. Reverse cycle air conditioning, Ceiling fan, Mini bar, Microwave,Telephone, Alarm clock radio, Dining setting, Iron and Ironing board, Electric blankets. Tea and coffee facilities including coffee pod machineDaily room service, Quality linen and towels. Swimming Pool and Barbeque facilities. 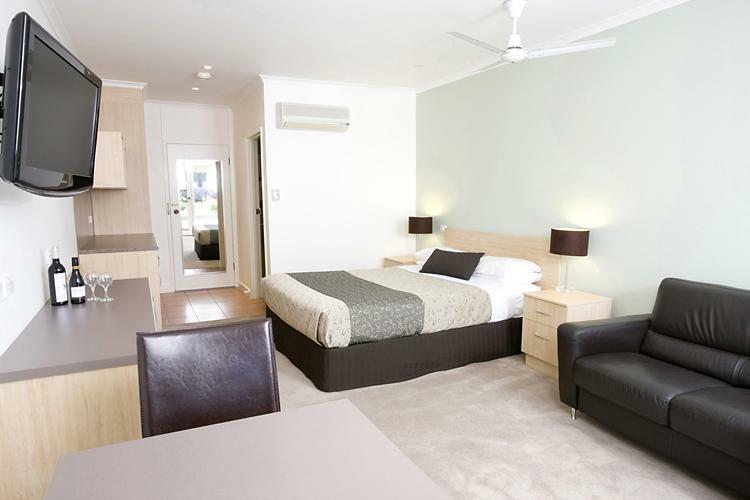 Refurbished 4 Star room with 1 X King bed and 1 X Single bed with ensuite bathroom. Room has an outdoor balcony with your own table and chairs overlooking surrounding bush. 106cm Plasma Television with free 10 channel Austar television. Wireless Broadband Internet Access. Catch the courtesy vehicle to town or your favourite restaurant. 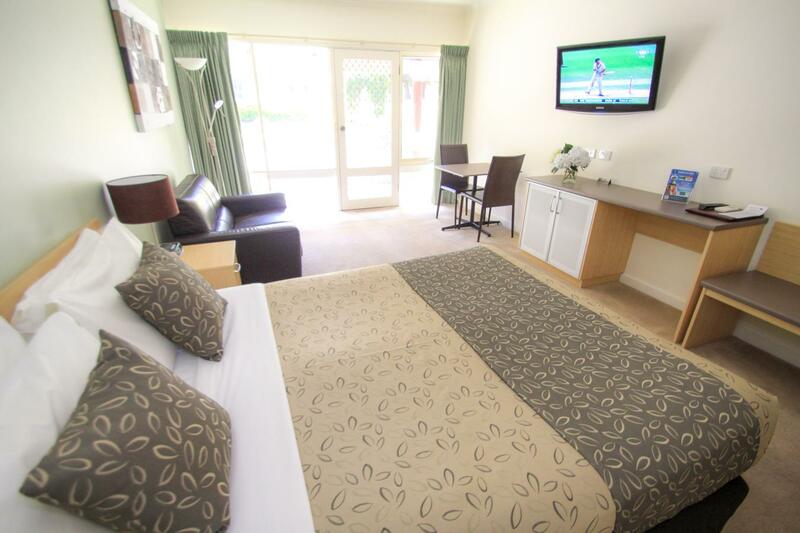 Refurbished 4 Star Room with 1 X King bed and 1 X Single bed with ensuite bathroom. Room has an outdoor balcony with outdoor setting overlooking surrounding bushland. 106cm Plasma televisions with free 10 channel Foxtel TV. Wireless Internet Access. Reverse cycle air conditioning, Ceiling fan, Mini bar, Microwave, Toaster,Telephone, Alarm clock radio, Dining setting, Iron and Ironing board , Electric blankets. Tea and coffee facilities including coffee pod machine.Daily room service, Quality linen and towels. Swimming Pool and Barbeque facilities. Enjoy the comforts of our fully refurbished room. 1 X queen bed with ensuite bathroom. 81cm. LCD TV & 10 Austar channels, including Movie channels and Fox Sports. Free Wireless Internet Access. Swimming pool & BBQ facilities. Catch the Courtesy Vehicle to your Restaurant. Motel is 1.5 kilometres from the Post Office. Catch the courtesy vehicle to town or your favourite restaurant. Refurbished Deluxe Queen room consists of 1 X queen bed with ensuite bathroom, 81cm LCD TV with a front view of standard roses. Foxtel TV. Wireless Internet Access. Reverse cycle air conditioning, Ceiling fan, Mini bar, Microwave,Telephone, Alarm clock radio, Dining setting, Iron and Ironing board, Electric blankets. Tea and coffee facilities including coffee pod machine,Daily room service, Quality linen and towels. Swimming Pool and Barbeque facilities. Enjoy the comforts of our fully refurbished room. 1 X queen bed and 1 single bed with ensuite bathroom. 81cm. LCD TV & 10 Austar channels, including Movie channels and Fox Sports. Free Wireless Internet Access. Swimming pool & BBQ facilities. Catch the Courtesy Vehicle to your Restaurant. Motel is 1.5 kilometres from the Post Office. Catch the courtesy vehicle to town or your favourite restaurant. Refurbished Deluxe Queen Twin room consists of 1 X Queen bed and 1 X Single Bed with ensuite bathroom, 81cm LCD TV with a front view of standard roses. Foxtel TV. Wireless Internet Access. Reverse cycle air conditioning, Ceiling fan, Mini bar, Microwave,Telephone, Alarm clock radio, Dining setting, Iron and Ironing board, Electric blankets. Tea and coffee facilities including coffee pod machine,Daily room service, Quality linen and towels. Swimming Pool and Barbeque facilities. 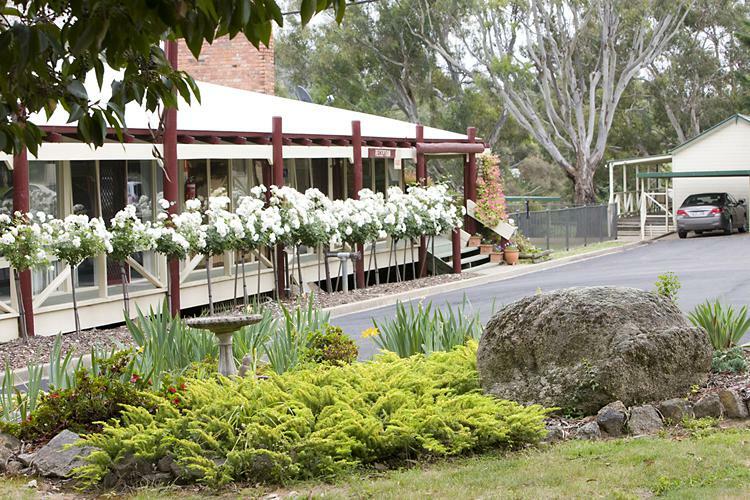 The Golden Heritage Accommodation, is located in a picturesque part of Beechworth overlooking the township, Beechworth Historic Park and The Gorge. 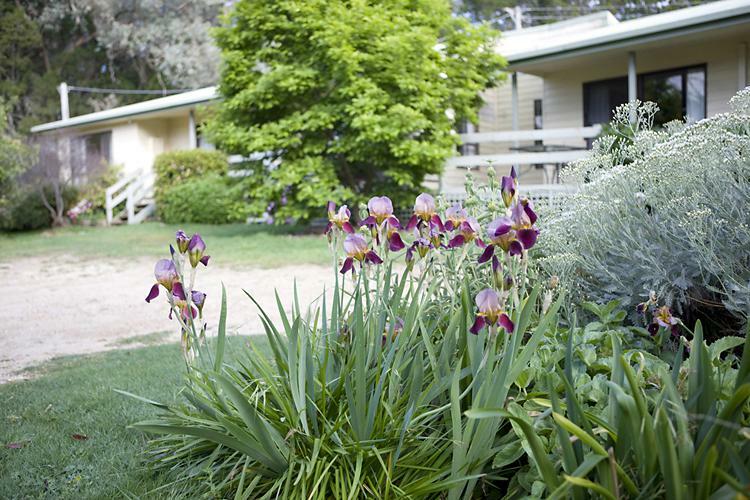 We have several different styles of accommodation available from Deluxe Queen and Executive King Motel Rooms, to cosy fully self contained Cottages and Annie's Apartments. A leisurely 15 minute walk or 2 minutes drive will take you to the centre of the historic village of Beechworth, which offers hours of browsing through speciality, and craft shops. Sample the delights from Beechworth Honey, the famous Beechworth Bakery and Beechworth Sweet Co., indulge in a gourmet wood fired pizza washed down with a handcrafted ale at the Bridge Road Brewery or just soak up Beechworth’s rich, gold rush history. Located in a tranquil, country bush setting with an abundance of bird life which can be enjoyed from the balcony or deck surrounding the your accommodation. The Property also has an undercover BBQ area, swimming pool and is located at the start of several walking trails. All rooms have tea & coffee making facility, coffee pod espresso machines, microwaves, toaster, ironing facilities, mini bar (motel only) and Foxtel. The Motel and Cottages car park is fully sealed, while the apartments has a short gravel driveway. Melbourne: Head north along the Hume Highway towards Albury, after passing first Wangaratta exit look for the Beechworth sign at the Great Alpine Road exit. Turn right onto Great Alpine Road and once you reach the 80km signs at Tarrawingee, veer left onto Beechworth-Wangaratta Road. This road will take you through the main township of Beechworth and onto Sydney Road, with the Motel being located on the left hand site about a 1km pass the roundabout. Canberra/Sydney: Follow the Hume Highway south towards Victoria and after passing Albury take the Beechworth/Bandiana Exit at Wodonga. This exit leads you onto Bandiana Link Road and you continue straight along this road through 4 roundabouts, until you ready the roundabout at Beechworth Road. Turn left into Beechworth Road and follow the signs to Beechworth. The Motel is located on the right hand side as you enter town, just pass the Horseshoe Monument. Members booking through this site will receive their benefits when they present their card at check-in. The benefits will be based on the current directory rates at the time of check-in and peak period surcharges may apply. When making a reservation please enter “Golden Chain Member” into the comments field. A valid credit card is required to secure a booking, this also applies to guests checking in without a reservation. Accommodation charge are payable on arrival with the balance of all remaining charges is payable on departure. Bookings during event and peak periods may be subject to an advanced deposit equivalent to one nights accommodation taken 30 days prior to the event. This applies to Telephone, Website and Online Travel Agent booking regardless of their cancellation policy. All Bookings subject to a deposit will be contacted via phone or email prior to the deposit being withdrawn. Cancellation must occur 72 hours prior to booking date or the first night's tariff will be charged in full. Bookings that do not show up will be changed the full price of the booked accommodation up to the value of two days. If you are planning on arriving after 9.30pm please call and arrange for an after hours check-in. If you are arriving early to ride the Murray to Mountains Rail Trail or embark on a Bush walk you are most welcome to leave your car at our accommodation, but in most cases your room will not be ready until after lunch.